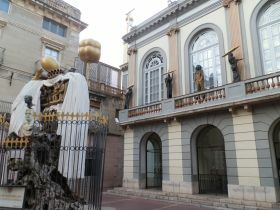 Figueres is the second major inland town for the Costa Brava after Girona. It is also the first main Catalan town from France and so has something of a border-town feel to it with a blend of cross-border shopping and the feeling of a French influence. 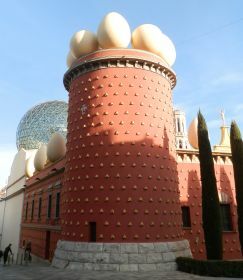 As a town, Figueres is most famous as the location of the Dali Museum - an elaborate surrealist palace created by Dali from the old theatre in Figueres. 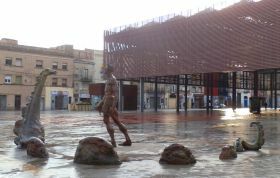 For visitor to Figueres, the town is somewhat ecletic. The Dali Museum is excellent and strongly worth visiting, both from the outside with eggs and golden figures perching above the museum walls and scupltures balanced on columns of tyres, or from the inside where you can see paintings, sculptures and jewelry by Dali (though not the most famous Dali painting - 'The Persistence of Memory' with the melting watches). Around the museum area is a small network of streets with fancy shops and restaurants almost in a French style, and there is a large Rambla and market nearby. However, outside the heard of the town Figueres can appear a little drab with lots of oversize apartment blocks built in an 1970s style, with the classic Spanish style of tall buildings with empty panelled walls waiting for the neighbouring buildings to fill in the gaps. In general, it feels like the town is improving over time, but the process seems slow and there are still unkept corners. Away from the main town centre, there are larger shopping centres and retail parks out towards Roses. The French influence can be felt and there is usually some different shopping than in Girona or further south with more products, visitors and French home-owners close to Figueres and across to Roses. As an aside, in general the range of products in Catalan supermarkets is lower than for the UK or France and it can be difficult to find certain product lines, or where they do exist they can be very expensive and occasionally we need to go to France to find certain products because they aren't common or popular in Spain. To us it's always a surprise at how little French food crosses the border. So we often go to France to stock up on cordials and squash, or to find joints of meat, duck, and at Christmas a range of traditional Christmas foods including turkeys (though they can be found here if you know where to look), spices and certain herbs or food ingredients, or certain types of electrical goods. For other visitors, Figueres now also boasts two train stations - the main station is the older slow line that connects to Port Bou to the north on the French border and to Girona and Barcelona to the south. This is relatively close to the centre - to get to the Dali Museum is just a trip across the market square, and around the corner and one street further on. The second station is the brand new station for the modern high-speed AVE line at Vilafant that links Perpignan through the tunnel through the Pyrenees to Barcelona and then Madris with TGV type trains (Paris is about 5 hours away). Though the Vilafant station is a little further out compared to the main station, it's still only about 1.5km from the centre of Figueres. The Castle is low sunk fortress that sits on the hill above Figueres behind the hospital. It's very very big - more than 3km to walk all around the outside with large brick and earthwork walks built in a complex pattern of triangles and bastions. It dates from 1750s, built in response to the loss of the Chateau de Bellegarde at Le Perteus in the 1690s after a series of wars and skirmishes between the French and Spanish in the 17th Century including an independent Catalonia under Pau Claris with French protection. For historical context, this was the time of Louis XIV and the scheming Cardinal Richlieu of Three Musketeers fame. Unfortunately when we arrived the main central part of the castle was closed. Having only seen the outer walls from the Autopista were the castle seemed a little neglected, in fact close up the castle is well maintained. The low defensive structures that give this impression as the castle is built into the ground almost reminiscent of a neolithic fort with deep gullies and lines of brick-faced earthenwork walls. At the time it was constructed, the power of cannon offenses and the growing size of armies meant the older tall keep and high walled medieval castles that are common in the UK, were too easily breeched. And while the UK broadly stopped building castles in Tudor times, moving instead to more stately homes, on the continent borders, invasions and rebellions remained a real possibility (in the UK, the ports defences are probably the most similar to the massive earthwork forts than can be found in Catalonia). 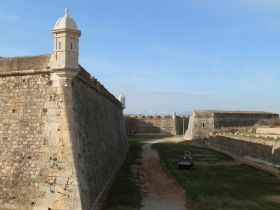 Ciutadellas and massive forts can be found at Salses, Mont-Louis and Confluent in French Catalonia, and at Roses, Girona and Barcelona in addition to Figueres on the Spanish side of the border. More surprising were the views from the castle with clear views to Roses (which has it's own enormous Ciutadella) and up to Bellegarde on the pass to France. The location close to the French border also made it an important staging post for the mass exodus of people as they fled the Spanish Civil War. The castle itself was the site of the last meeting of the Republican government prior to Franco's victory. From the viewpoint the road runs straight down to the Dali Museum in the town. The Dali theatre museum is a mix of extravagancies with a glass sphere, giant white eggs and golden figures rising above pink walls that have yellow elements that look like brioche loafs studding the wall. 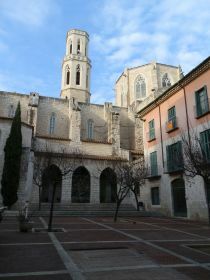 The museum sits in the centre of the town in a former theatre, very close to the church and there is a contrast with the plainer white architecture of the main Figueres church. The main entrance is via a placa behind the church full of curiosities and sculptures which the main entrance clearly showing the buildings' heritage as an old theatre. Dali himself built the museum in the 1960s so it's very much a homage to his vision, rather than a collectors type museum, and that makes it much more fun. We've visited several times but didn't go in this time. Around the Museum area, are smart streets with shops and restaurants that eventually lead to the main Rambla - a very broad promenade in the centre of the town. 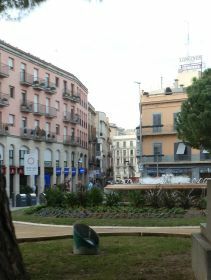 From here, the last area to see is the market area which joins the street at the bottom of the Rambla in the direction of the main (older) station with more sculptures and a floating cover for the market.